Wilkesboro is a town in and the county seat of Wilkes County, North Carolina. Start off your visit on the 14th (Fri): take an in-depth tour of Wilkes Heritage Museum. 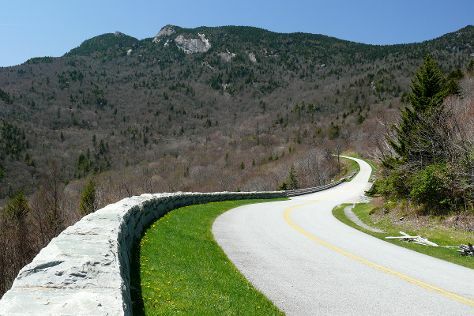 Keep things going the next day: see the interesting displays at Blue Ridge Music Center and then take a memorable drive along Blue Ridge Parkway. For more things to do, maps, traveler tips, and tourist information, you can read our Wilkesboro trip planner . New York City to Wilkesboro is an approximately 6.5-hour flight. You can also drive. In June, plan for daily highs up to 83°F, and evening lows to 61°F. Finish your sightseeing early on the 16th (Sun) so you can travel to Shelby. Shelby is a city in and the county seat of Cleveland County, North Carolina, United States. Kick off your visit on the 17th (Mon): view the masterpieces at Cleveland County Arts Council, then stroll through Shelby City Park, and then explore and take pictures at Keeter Stadium. To find maps, photos, where to stay, and tourist information, use the Shelby trip itinerary planner . Traveling by car from Wilkesboro to Shelby takes 2 hours. In June in Shelby, expect temperatures between 85°F during the day and 66°F at night. Wrap up your sightseeing on the 17th (Mon) to allow time to travel to Mountain Rest. On the 18th (Tue), explore and take pictures at Chattooga Belle Farm, take in the dramatic scenery at Yellow Branch Falls, then admire the sheer force of Station Cove Falls, and finally take in the awesome beauty at King Creek Falls. To find reviews, more things to do, and tourist information, refer to the Mountain Rest trip planner . You can drive from Shelby to Mountain Rest in 2.5 hours. In June in Mountain Rest, expect temperatures between 87°F during the day and 65°F at night. Cap off your sightseeing on the 18th (Tue) early enough to travel to Tellico Plains. Tellico Plains is a town in Monroe County, Tennessee, United States. Start off your visit on the 19th (Wed): explore the activities along Ocoee Outdoors, Inc. and then let the river carry you with a rafting and tubing tour. On the 20th (Thu), you'll have a packed day of sightseeing: take in the dramatic scenery at Bald River Falls and then explore the activities along Adventures Unlimited. For more things to do, maps, other places to visit, and more tourist information, you can read our Tellico Plains route planning tool . Drive from Mountain Rest to Tellico Plains in 3 hours. In June in Tellico Plains, expect temperatures between 84°F during the day and 62°F at night. Cap off your sightseeing on the 20th (Thu) early enough to travel to Maryville. Maryville is a city and the county seat of Blount County, Tennessee, in the southeastern United States. Venture out of the city with trips to Great Smoky Mountains National Park (Clingmans Dome, Walker Sisters' Cabin, & more) and Tuckaleechee Caverns (in Townsend). Next up on the itinerary: tour the pleasant surroundings at Abrams Falls Trail and do a tasting at Blue Goose Farm and Vineyards. You can plan Maryville trip in no time by asking Inspirock to help create your itinerary. You can drive from Tellico Plains to Maryville in an hour. In June in Maryville, expect temperatures between 86°F during the day and 66°F at night. Cap off your sightseeing on the 23rd (Sun) early enough to travel back home.